Australian James Davison has scored a one-off drive with Corvette team Mike Baughman Racing for this Friday’s Grand-Am Series race at Indianapolis Motor Speedway. The third-generation driver will team with 22-year-old Indy Lights Series front-runner Sebastian Saavedra for the Brickyard Grand Prix. Davison, who has had a lean racing schedule since finishing second in the 2009 Indy Lights season, says he’s looking forward to teaming with the Colombian. 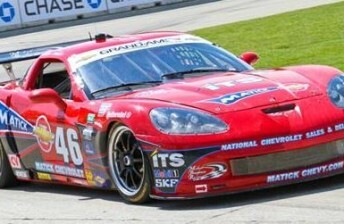 “I am excited to partner Sebastian in the #46 Corvette,” Davison told Speedcafe.com. “We battled for the Indy Lights Championship together in 2009 and have become good friends ever since. This Friday’s race, which supports Sunday’s Brickyard 400 NASCAR Sprint Cup event, is the first for the Grand-Am Series on the Indy road course. Davison however has previously tasted success at the circuit, winning a Formula BMW support race at the ill-fated 2005 United States Formula 1 Grand Prix.